If you’re looking for a capable, off-road-ready SUV that beats out the competition, the new Toyota 4Runner will always be up to the challenge. 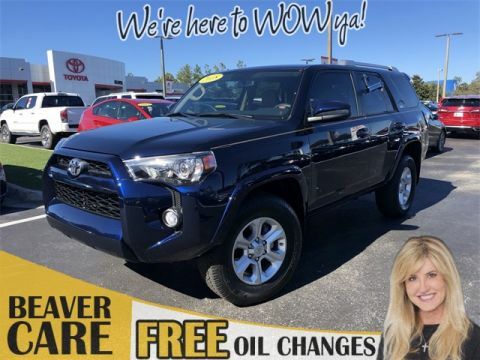 Still, folks looking to save some cash on their next SUV near Jacksonville would be wise to strongly consider a Certified Pre-Owned Toyota 4Runner. 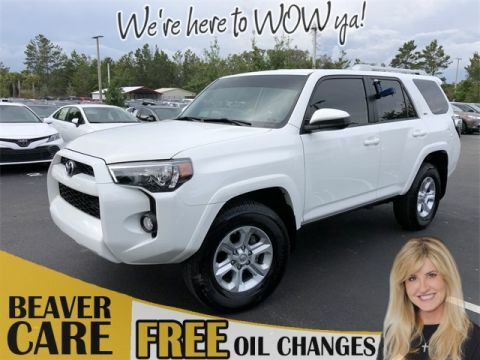 Fortunately, Beaver Toyota has CPO 4Runner SUVs for sale near Palm Coast, including recent 4Runner models that have won awards like Kelley Blue Book’s “Best Resale Value: Midsize SUV/Crossover.” On top of that, the Toyota Certified Used Vehicle (TCUV) Program boasts a comprehensive quality assurance inspection, as well as a limited warranty, roadside assistance, and much more! Find your next Certified Pre-Owned Toyota 4Runner here, and then contact Beaver Toyota in St. Augustine to set up a test drive. CARFAX One-Owner. Clean CARFAX. Certified. PRISTINE CONDITION, GPS / NAVI / NAVIGATION, Bluetooth Handsfree, NO ACCIDENTS ON CARFAX REPORT, TOYOTA CERTIFIED*7 YEAR/100K MILE WARRANTY*$0 DEDUCTIBLE*BUY WITH PEACE OF MIND, Rear View Camera, One Owner, NONSmoker, Local Trade, Bought here NEW!, MUST SEE!, Fresh Oil Change, Passed 160 Point Toyota Certified Inspection, Passed Dealership Inspection, Freshly Detailed, MINT CONDITION, EXCELLENT CONDITION, ANOTHER ONE OF OUR TOP CERTIFIED USED CARS ,WE ARE RANKED ON THE TOP 10 IN THE COUNTRY ,WE SELL THE BEST SERVICED USED CARS IN THE MARKET ,NOBODY SELLS MORE USED CARS THAN BEAVER TOYOTA ,PLEASE COME SEE US AND BE PART OF OUR ROYAL SERVICE EXPERIENCE ,ONLY HERE AT BEAVER TOYOTA! !THE ONLY PLACE TO BUY A USED CAR!!. Priced below KBB Fair Purchase Price! Gray 2015 Toyota 4Runner SR5 RWD 4.0L V6 SMPI DOHC Toyota Certified Used Vehicles Details: * Powertrain Limited Warranty: 84 Month/100,000 Mile (whichever comes first) from original in-service date * Limited Comprehensive Warranty: 12 Month/12,000 Mile (whichever comes first) from certified purchase date. 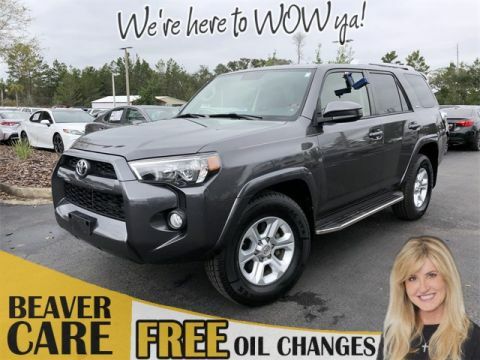 Roadside Assistance for 1 Year * Vehicle History * Transferable Warranty * Warranty Deductible: $50 * 160 Point Inspection * Roadside Assistance Awards: * 2015 KBB.com Best Resale Value Awards Gray 2015 Beaver Toyota 4Runner SR5 is a 4D Sport Utility RWD . This Florida SUV has a 4.0L V6 SMPI DOHC engine. Call right now and schedule a test drive. 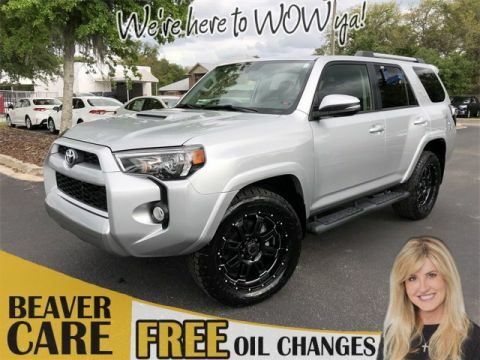 Ask for stock number 5185849A, the Florida 2015 Beaver Toyota 4Runner . Shop Us Online at www.beavertoyotastaugustine.com. Serving Jacksonville, Palm Coast, Daytona, Gainesville and St Augustine. Beaver Toyota St Augustine on 2995 US Hwy 1 South in St Augustine. CARFAX One-Owner. Clean CARFAX. Certified. 17" x 7.0" 6-Spoke Alloy Wheels, ABS brakes, Body Color Heated Mirrors, Compass, Electronic Stability Control, Heated door mirrors, Heated Front Bucket Seats, Heated front seats, Illuminated entry, Low tire pressure warning, Power moonroof, Power Tilt & Slide Moonroof w/Sunshade, Remote keyless entry, Traction control. Nautical Blue Pearl 2016 Toyota 4Runner SR5 Premium RWD 4.0L V6 SMPI DOHC Toyota Certified Used Vehicles Details: * Vehicle History * Limited Comprehensive Warranty: 12 Month/12,000 Mile (whichever comes first) from certified purchase date. Roadside Assistance for 1 Year * Powertrain Limited Warranty: 84 Month/100,000 Mile (whichever comes first) from original in-service date * Warranty Deductible: $50 * Transferable Warranty * 160 Point Inspection * Roadside Assistance Awards: * 2016 KBB.com Best Resale Value Awards Nautical Blue Pearl 2016 Beaver Toyota 4Runner SR5 Premium is a 4D Sport Utility RWD . This Florida SUV has a 4.0L V6 SMPI DOHC engine. Call right now and schedule a test drive. Ask for stock number D509098A, the Florida 2016 Beaver Toyota 4Runner . Shop Us Online at www.beavertoyotastaugustine.com. Serving Jacksonville, Palm Coast, Daytona, Gainesville and St Augustine. Beaver Toyota St Augustine on 2995 US Hwy 1 South in St Augustine. CARFAX One-Owner. Clean CARFAX. Certified. PRISTINE CONDITION, NO ACCIDENTS ON CARFAX REPORT, TOYOTA CERTIFIED*7 YEAR/100K MILE WARRANTY*$0 DEDUCTIBLE*BUY WITH PEACE OF MIND, Rear View Camera, One Owner, Passed 160 Point Toyota Certified Inspection, Passed Dealership Inspection, ABS brakes, Alloy wheels, Electronic Stability Control, Heated door mirrors, Illuminated entry, Low tire pressure warning, Remote keyless entry, Traction control. Priced below KBB Fair Purchase Price! Nautical Blue Metallic 2018 Toyota 4Runner SR5 4WD 4.0L V6 SMPI DOHC Toyota Certified Used Vehicles Details: * 160 Point Inspection * Vehicle History * Powertrain Limited Warranty: 84 Month/100,000 Mile (whichever comes first) from original in-service date * Roadside Assistance * Transferable Warranty * Warranty Deductible: $50 * Limited Comprehensive Warranty: 12 Month/12,000 Mile (whichever comes first) from certified purchase date. Roadside Assistance for 1 Year Nautical Blue Metallic 2018 Beaver Toyota 4Runner SR5 is a 4D Sport Utility 4WD . This Florida SUV has a 4.0L V6 SMPI DOHC engine. Call right now and schedule a test drive. Ask for stock number 562261, the Florida 2018 Beaver Toyota 4Runner . Shop Us Online at www.beavertoyotastaugustine.com. Serving Jacksonville, Palm Coast, Daytona, Gainesville and St Augustine. Beaver Toyota St Augustine on 2995 US Hwy 1 South in St Augustine. CARFAX One-Owner. Clean CARFAX. Certified. PRISTINE CONDITION, GPS / NAVI / NAVIGATION, SUNROOF / MOONROOF / ROOF, Leather, Bluetooth Handsfree, NO ACCIDENTS ON CARFAX REPORT, TOYOTA CERTIFIED*7 YEAR/100K MILE WARRANTY*$0 DEDUCTIBLE*BUY WITH PEACE OF MIND, Rear View Camera, LEATHER, One Owner, NONSmoker, Local Trade, MUST SEE!, Fresh Oil Change, Passed 160 Point Toyota Certified Inspection, Passed Dealership Inspection, Freshly Detailed, MINT CONDITION, EXCELLENT CONDITION, WHY NOT BUY YOUR NEXT USED CAR FROM BEAVER TOYOTA ,THE TOP TEN CERTIFIED USED CAR DEALERSHIP IN THE COUNTRY! !THE BEST USED CARS ARE HERE AT BEAVER TOYOTA ,THE ABSOLUTE BEST USED CARS FOR YOU AND YOUR FAMILY,WE CARE FOR OUR CUSTOMERS FOR LIFE! !, Auto-Dimming Rear-View Mirror, Body Color Heated Mirrors, Garage Door Opener, Navigation System, SR5 Premium Package w/Softex. Priced below KBB Fair Purchase Price! White 2018 Toyota 4Runner SR5 Premium RWD 4.0L V6 SMPI DOHC Toyota Certified Used Vehicles Details: * 160 Point Inspection * Warranty Deductible: $50 * Limited Comprehensive Warranty: 12 Month/12,000 Mile (whichever comes first) from certified purchase date. 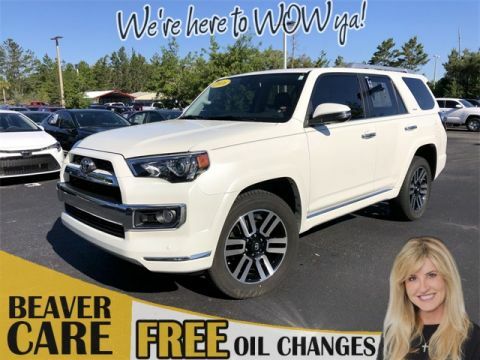 Roadside Assistance for 1 Year * Transferable Warranty * Vehicle History * Roadside Assistance * Powertrain Limited Warranty: 84 Month/100,000 Mile (whichever comes first) from original in-service date White 2018 Beaver Toyota 4Runner SR5 Premium is a 4D Sport Utility RWD . This Florida SUV has a 4.0L V6 SMPI DOHC engine. Call right now and schedule a test drive. 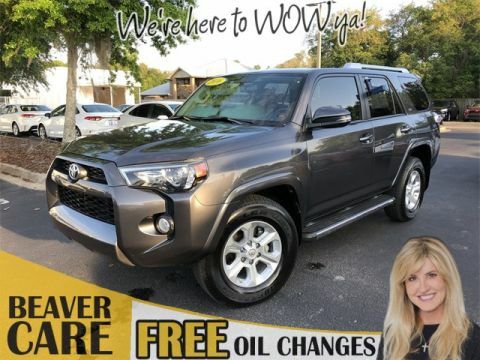 Ask for stock number U234285A, the Florida 2018 Beaver Toyota 4Runner . Shop Us Online at www.beavertoyotastaugustine.com. Serving Jacksonville, Palm Coast, Daytona, Gainesville and St Augustine. Beaver Toyota St Augustine on 2995 US Hwy 1 South in St Augustine. CARFAX One-Owner. Clean CARFAX. Certified. PRISTINE CONDITION, GPS / NAVI / NAVIGATION, Bluetooth Handsfree, NO ACCIDENTS ON CARFAX REPORT, TOYOTA CERTIFIED*7 YEAR/100K MILE WARRANTY*$0 DEDUCTIBLE*BUY WITH PEACE OF MIND, Rear View Camera, One Owner, NONSmoker, Local Trade, MUST SEE!, Fresh Oil Change, Passed 160 Point Toyota Certified Inspection, Freshly Detailed, MINT CONDITION, EXCELLENT CONDITION, 4X4 4X4 4X4 TOP CERTIFIED DEALERSHIP IN THE COUNTRY ,WHY NOT BUY YOUR NEXT USED CAR FRO SOMEONE THAT REALLY CARES ,THE BEAVER WORLD CAME TO TOWN TO EMBRACE AND TAKE CARE OF THIS MARKET FOR EVER ,WE ARE HERE TO TAKE CARE OF YOU AND YOUR FAMILY FOR LIFE! !OUR ROYAL STANDARD OF SERVICE WILL JOIN YOU AND YOUR FAMILY FOR LIFE! !, ABS brakes, Alloy wheels, Electronic Stability Control, Heated door mirrors, Illuminated entry, Low tire pressure warning, Remote keyless entry, Traction control. White 2018 Toyota 4Runner SR5 4WD 4.0L V6 SMPI DOHC Toyota Certified Used Vehicles Details: * Vehicle History * Warranty Deductible: $50 * Transferable Warranty * Powertrain Limited Warranty: 84 Month/100,000 Mile (whichever comes first) from original in-service date * Limited Comprehensive Warranty: 12 Month/12,000 Mile (whichever comes first) from certified purchase date. Roadside Assistance for 1 Year * Roadside Assistance * 160 Point Inspection White 2018 Beaver Toyota 4Runner SR5 is a 4D Sport Utility 4WD . This Florida SUV has a 4.0L V6 SMPI DOHC engine. Call right now and schedule a test drive. 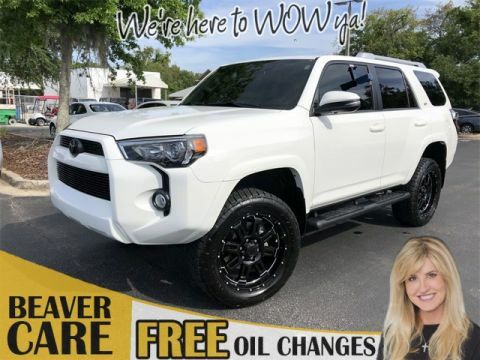 Ask for stock number 037324A, the Florida 2018 Beaver Toyota 4Runner . Shop Us Online at www.beavertoyotastaugustine.com. Serving Jacksonville, Palm Coast, Daytona, Gainesville and St Augustine. Beaver Toyota St Augustine on 2995 US Hwy 1 South in St Augustine. CARFAX One-Owner. Clean CARFAX. Certified. PRISTINE CONDITION, GPS / NAVI / NAVIGATION, SUNROOF / MOONROOF / ROOF, Leather, Bluetooth Handsfree, NO ACCIDENTS ON CARFAX REPORT, TOYOTA CERTIFIED*7 YEAR/100K MILE WARRANTY*$0 DEDUCTIBLE*BUY WITH PEACE OF MIND, Rear View Camera, LEATHER, One Owner, NONSmoker, Local Trade, MUST SEE!, Fresh Oil Change, Passed 160 Point Toyota Certified Inspection, Passed Dealership Inspection, Freshly Detailed, MINT CONDITION, EXCELLENT CONDITION, Blizzard Pearl, ONE OWNER OFF LEASE ,THE BEST USED CARS TO BUY ,AND WE HAVE THENM HERE AT BEAVER TOYOTA IN ST AUGUSTINE! !THE PLACE THAT CARES AND WANTS EVERY SINGLE CUSTOMER TO BE PART OF OUR BEAVER FAMILY FOR LIFE ,WE WANT TO TAKE CARE OF YOU AND YOUR FAMILY FOR LIFE! !WE PROMISE THAT YOU WILL BE BUYING THE BEST AND SAFEST USED CAR IN THE MARKET! !, ABS brakes, Alloy wheels, Body Color Heated Mirrors, Compass, Electronic Stability Control, Emergency communication system, Front dual zone A/C, Heated door mirrors, Heated front seats, Heated/Ventilated Front Bucket Seats, Illuminated entry, Leather Seat Trim, Low tire pressure warning, Power moonroof, Power Tilt & Slide Moonroof w/Sunshade, Remote keyless entry, Traction control. Blizzard Pearl 2016 Toyota 4Runner Limited 4WD 4.0L V6 SMPI DOHC Toyota Certified Used Vehicles Details: * Vehicle History * Powertrain Limited Warranty: 84 Month/100,000 Mile (whichever comes first) from original in-service date * Warranty Deductible: $50 * Roadside Assistance * 160 Point Inspection * Limited Comprehensive Warranty: 12 Month/12,000 Mile (whichever comes first) from certified purchase date. Roadside Assistance for 1 Year * Transferable Warranty Awards: * 2016 KBB.com Best Resale Value Awards Blizzard Pearl 2016 Beaver Toyota 4Runner Limited is a 4D Sport Utility 4WD . This Florida SUV has a 4.0L V6 SMPI DOHC engine. Call right now and schedule a test drive. Ask for stock number 321654, the Florida 2016 Beaver Toyota 4Runner . Shop Us Online at www.beavertoyotastaugustine.com. Serving Jacksonville, Palm Coast, Daytona, Gainesville and St Augustine. Beaver Toyota St Augustine on 2995 US Hwy 1 South in St Augustine. CARFAX One-Owner. Certified. PRISTINE CONDITION, GPS / NAVI / NAVIGATION, SUNROOF / MOONROOF / ROOF, Leather, Bluetooth Handsfree, NO ACCIDENTS ON CARFAX REPORT, TOYOTA CERTIFIED*7 YEAR/100K MILE WARRANTY*$0 DEDUCTIBLE*BUY WITH PEACE OF MIND, Rear View Camera, LEATHER, One Owner, NONSmoker, Towing Package, MUST SEE!, Fresh Oil Change, Passed 160 Point Toyota Certified Inspection, Passed Dealership Inspection, Freshly Detailed, MINT CONDITION, EXCELLENT CONDITION. Cement 2017 Toyota 4Runner TRD Off-Road 4WD 4.0L V6 SMPI DOHC Toyota Certified Used Vehicles Details: * Transferable Warranty * 160 Point Inspection * Roadside Assistance * Vehicle History * Powertrain Limited Warranty: 84 Month/100,000 Mile (whichever comes first) from original in-service date * Limited Comprehensive Warranty: 12 Month/12,000 Mile (whichever comes first) from certified purchase date. Roadside Assistance for 1 Year * Warranty Deductible: $50 Awards: * 2017 KBB.com Best Resale Value Awards * 2017 KBB.com 10 Most Awarded Brands Cement 2017 Beaver Toyota 4Runner TRD Off-Road is a 4D Sport Utility 4WD . This Florida SUV has a 4.0L V6 SMPI DOHC engine. Call right now and schedule a test drive. Ask for stock number 467488, the Florida 2017 Beaver Toyota 4Runner . Shop Us Online at www.beavertoyotastaugustine.com. Serving Jacksonville, Palm Coast, Daytona, Gainesville and St Augustine. Beaver Toyota St Augustine on 2995 US Hwy 1 South in St Augustine. Each of the CPO Toyota 4Runner SUVs for sale at Beaver Toyota features a rugged body-on-frame truck chassis and a capable V6 engine. You’ll also have access to a 4×4 drivetrain and a variety of exclusive off-road performance features. While you’re here, check out our entire lineup of new Toyota vehicles, as well as our available financing options. At our dealership, you’ll enjoy numerous used car buying advantages, including a 5-day exchange policy and our guaranteed “Wow Price.” So come visit us in St. Augustine today!